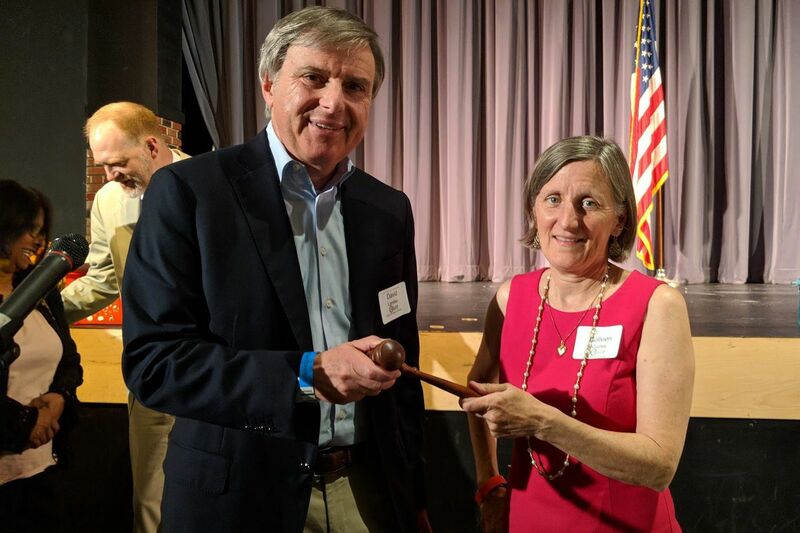 Outgoing Delco Democratic Party leader David Landau hands the gavel to new leader Colleen Guiney. Delaware County Democrats elected Colleen Guiney as their new leader this week. She was the so-called compromise candidate between warring factions of local Democrats who are finally gaining an edge in the longtime GOP stronghold. Guiney. Guiney. Why does that name sound familiar? Clout went back and checked the clips. Ah, yes. Now it's coming back. The 2010 congressional election between Republican Pat Meehan and Democrat Bryan Lentz. Guiney was involved in what the Daily News called a "Machiavellian political ploy" to help Lentz by gathering signatures for right-wing independent Jim Schneller, a staunch anti-abortion activist who had filed a lawsuit in 2008 questioning Barack Obama's citizenship in an effort to block him from being sworn in. The Democrats' plan was to gather enough signatures to get the conservative birther on the ballot (which they did) so he would pull votes from Meehan and propel Lentz into what was then the Seventh Congressional District seat. Meehan, however, won — handily. Schneller, who occasionally spoke in the third person and was one of the strangest fellows we've ever met, got about 1 percent of the vote. Guiney, who ran the Swarthmore Democratic Party and had been described by Lentz as "the hardest worker on my campaign," played a key role in the Schneller scheme and circulated petitions on his behalf. Back in 2010, Guiney, a pediatric nurse-practitioner, did not respond to multiple requests for comment. No surprise there. But with the Schneller story resurfacing amid her election as party chair, we reached out again this week to get her take. "I am proud of my efforts to stop Pat Meehan from ever reaching Congress. I only wish we'd been able to do more, because if we had, perhaps a young woman wouldn't have been scarred by Pat's behavior," Guiney e-mailed, referring to Meehan's resignation in April amid sexual harassment accusations. The ol' double-down-and-deflect strategy. Clout can appreciate a quote like that. There was a fight this week for the soul of the Philadelphia Democratic Party. On Monday, the party's foot soldiers — a.k.a. committee people — voted for the city's 69 Democratic ward leaders. Ward leaders are behind-the-scenes power players who influence local elections and choose the leader of the party. In some parts of the city, committee people voted for change in neighborhoods where the Democratic machine has long held sway. In most areas, though, the establishment stood strong. Berniecrats Adams Rackes and Nikil Saval scored a major win for progressives when they took over the First and Second Wards in South Philly, respectively. Their predecessors were allied with longtime local kingmaker John "Johnny Doc" Dougherty. Anton Moore, a 32-year-old anti-violence activist, won the ward leader post in South Philly's 48th Ward. He beat out incumbent ward leader Lee Schwartz and another candidate. In Fishtown's 18th Ward, Old Philly and New Philly joined together: Theresa Alicea, a longtime committee person, was elected ward leader. Several Democrats organized by Philadelphia 3.0, a group thought up by business leaders whose goal is to forge a "more competitive city," won ward officer positions there. In Northwest Philly's powerful 50th Ward, an era ended when former Councilwoman Marian Tasco didn't seek another term. Her protégé, Councilwoman Cherelle Parker, is the new leader. There was also a match-up between two Council people — Cindy Bass and Derek Green — for the leadership job in the 22nd Ward. Bass emerged victorious. There were changes in the Philly GOP, too. Vince Fenerty was forced out of his post as secretary of the Republican City Committee in Wednesday's election in a challenge brought by Jim Pio, a committeeman who ran unsuccessfully for state representative in the 172nd District in 2016. Fenerty resigned from his longtime post as head of the Philadelphia Parking Authority in 2016 after two sexual harassment cases went public. Michael Meehan, who easily won a second term as chairman of the local party, said Fenerty's controversies came back to haunt him. "A lot of people thought last night was the opportunity to even the score," Meehan said. "Even some people he had done good things for viewed his indiscretions badly. They were venting." State Sen. Daylin Leach pledged to do things differently. This was back in early January, when he was up to his neck in hot water. Prominent Democrats, including Gov. Wolf, had called on Leach to resign after the Inquirer and Daily News published an article about eight women who had accused him of subjecting them to unwanted physical contact and sexually charged conversations. His congressional campaign stalled, and even some ardent backers were alarmed when Leach called one of his accusers a "horrific monster" and a "human wrecking ball of hate" on Facebook. The senator wrote an earnest mea culpa about his behavior, which included this line: "I think the best way for me to apologize is to change my conduct. I promise to do that." ​Imagine, then, how surprised Clout was last Friday to see that Leach was generating buzz in Democratic circles on Twitter — for all the wrong reasons. Kelli Klein, tweeting from her account @Kelli_jo_, posted an old headline about the allegations against Leach, along with a message stating that he "is still an elected official, still has power, and STILL unfit to serve." "Being an internet troll must be exhausting," Leach responded. "But at least your parents must be so proud." Klein served as the digital director for the Democratic National Convention Committee in 2016. Several people rushed to defend Klein, including City Councilwoman Helen Gym and Anne Wakabayashi, the executive director of Emerge Pennsylvania, who chided Leach to "stop attacking women for standing up for other women." Asked about the social media posts, a spokesman for Leach said he "has nothing to add to what he's already said on Twitter." Leach also sent private messages to Wakabayashi and others, like Daily Kos political director David Nir, arguing that Klein was in fact a troll who was attacking him without knowing him. "Keep up the good fight for liberal values, like lying about other liberals on line," Leach wrote to Nir. "You are doing a bang-up job!" Staff writers William Bender, David Gambacorta, Holly Otterbein, Chris Brennan, and Angela Couloumbis contributed to this column.